Again, the size of your reserves reflects, and is proportional to, your potential need for funding. You can’t accumulate that many unless you have a similarly arrayed “dollar short.” The bigger the stockpile the more potential for it to get out of hand if things go the wrong way (usually on the self-reinforcing cycle of rising risk perceptions feeding volatility, or what we might call in different times and situations a “run”). 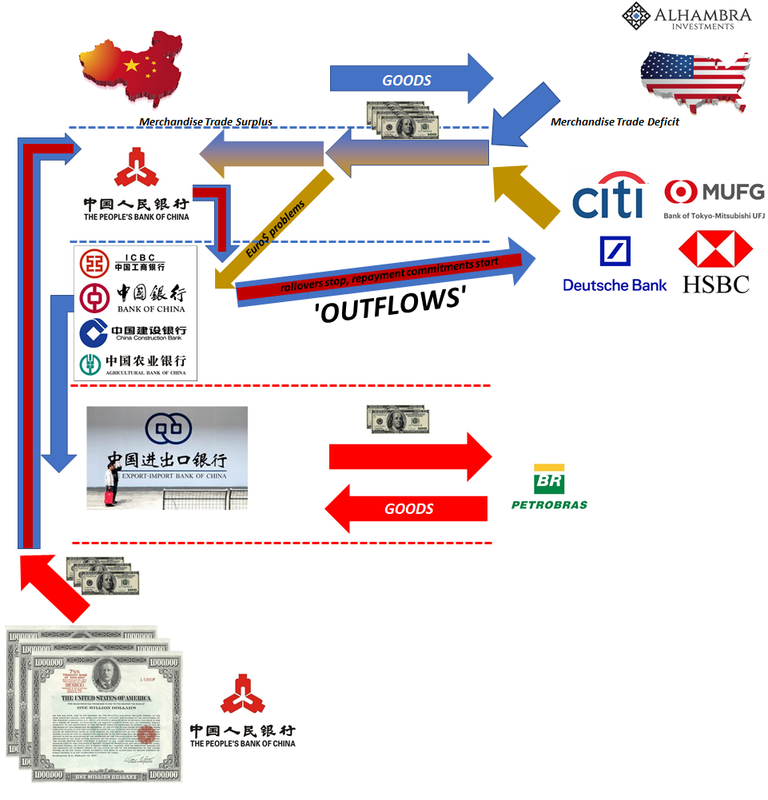 This is an important part of analysis, what has become since 2014 for a lot of countries their “nightmare.” Orthodox theory posits that the more forex reserves any nation has accumulated the better they are cushioned against “outflows” and therefore currency crisis to the point of “devaluation.” The Chinese demonstrated almost perfectly why that’s not the case. This “dollar short” is often complicated and tangled, a process rather than a single thing. When we think of “short” we often do so in terms of something like shorting a stock. Thus, it’s hard to conceive of why any country would seem to be betting against the “dollar” and how they might be doing so. It isn’t that way at all, however. There is no bet in either direction, instead there has been an accumulation of positions that leave parts of the system in what is really a synthetic short divorced from anything but operational considerations. Let’s start with the simple merchandise account diagram (above). This is the one most people think of, and even most “experts” and media commentary depend upon even though it leaves out pretty much everything that truly matters. You can even adapt it such that on the left-hand side is Saudi Arabia rather than China, where the goods deficit flowing to the US is purely oil instead of consumer trinkets. This latter would be the idea of a petrodollar, and it, too, is hugely incomplete. It’s here where you might hear how China will screw the US by selling its Treasury holdings as if it has the upper hand in any dispute (trade or otherwise). Yet, they did so 2014-16 and it didn’t work out so well for them (or us). What does everyone seem to be missing? The first part is how “dollars” get into China or any nation to begin with. The merchandise cycle is only one avenue, and often it isn’t nearly as much as the other. This other is characterized as “hot money” or “capital inflows”, yet they are as almost entirely interbank debt conjured from bank balance sheet capacity of all kinds (and therefore take on the more creative transactions we discuss, such as footnote dollars). But if there are complications going in toward China, there are many more once those “dollars” get there. 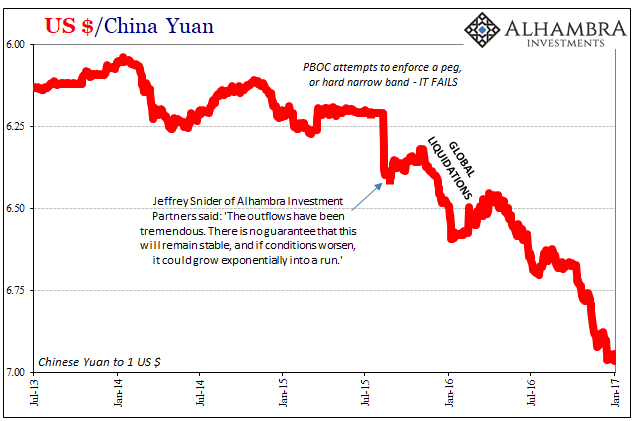 Prior to the currency float, it was the central bank (PBOC) that almost exclusively handled incoming flows. Afterward, it has been a mix of private/public internal to China. 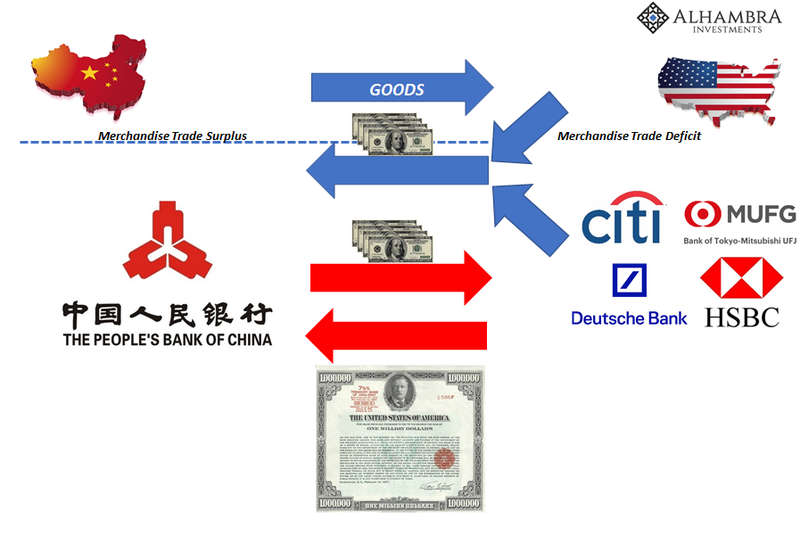 What happens is the second financial level (Chinese banks) are borrowing eurodollar capacity in short-term funding transactions in order to further lend toward China’s import needs – as well as other things Chinese banks have been up too regarding spreading financial accumulations around the world (like dollar/CNY swaps with African nations). The “short” is not really dollars so much as funding liabilities. It’s the same way as other global banks are “short” the same things; the “short” relates to the funding mismatch (maturity) between short-term interbank borrowing (globally) on the liability side supporting and maintaining longer duration loan or security assets.  Once you create those “dollar” assets, you are on the hook for funding them, in “dollars”, until they are disposed of – voluntarily or not. It leaves the internal Chinese system with a further process mismatch, whereby the central bank is synthetically long “dollars” while the private banks are synthetically short them. The PBOC still accumulates the vast majority of “reserves” given its role in regulating internal versus external liquidity. 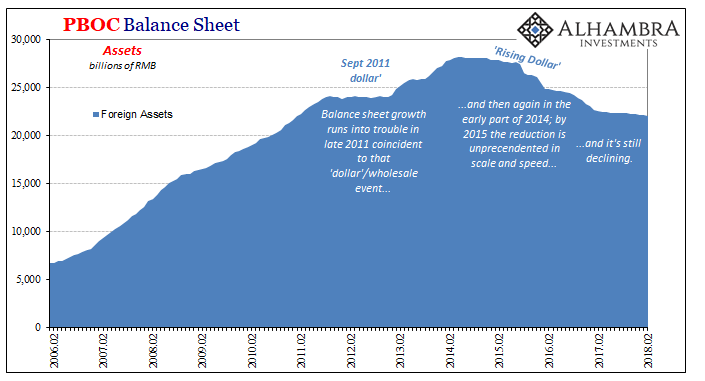 Like overall global “dollar” money market operation prior to August 2007, it seems to work well enough in seamless fashion until there are substantial problems. The Chinese didn’t really experience these until the “rising dollar” of 2014-16 because unlike in 2008 there was far less enthusiasm about Chinese growth prospects after 2012 and 2013 (risk, then volatility, then volatility feeding risk, and so on). China’s economy began to be perceived as more risk than it might have been worth (particularly from the Japanese perspective). This is where the nightmare scenario comes in. 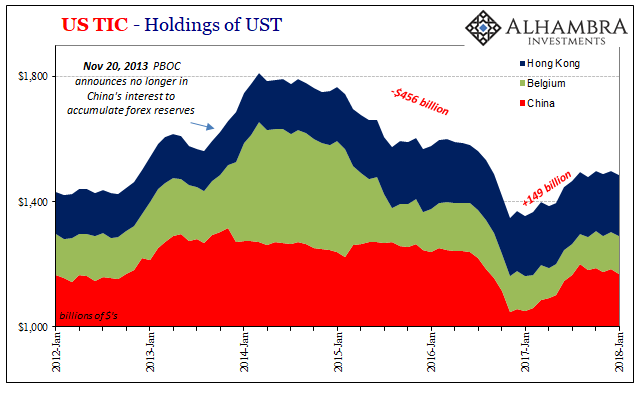 The level of accumulated reserves tells us something important about the nature of the existing “dollar short.” The more that ended up in the bottom piece as a “reserve” silo or synthetic long, that was because of the amount flowing into the second level creating the synthetic short. 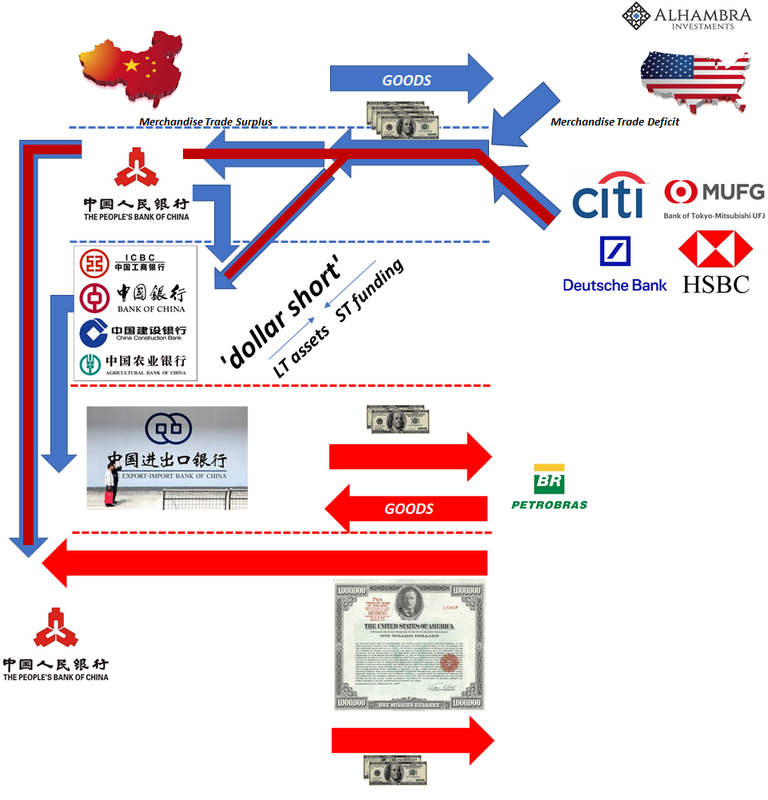 Or, the more Chinese banks were “short” the more that flowed into the PBOC while everything was working. Thus, the latter gives us a sense of scale should problems erupt in the former. Of course, that’s exactly what happened during the “rising dollar” episode. The increasing difficulty demanded by systemic eurodollar problems starting in 2013 but really picking up in the middle of 2014 reversed the process to a substantial degree. 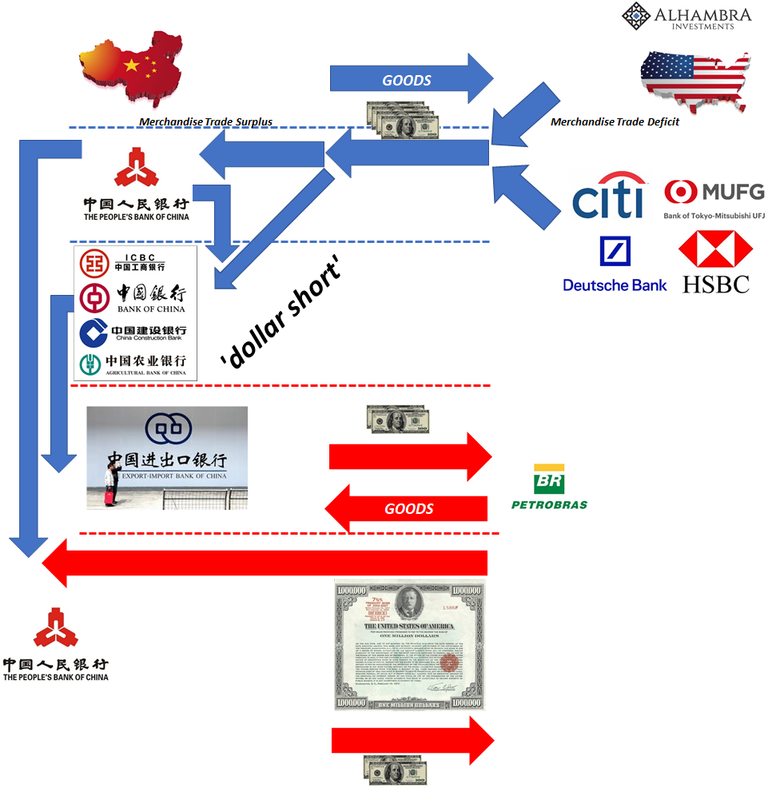 The PBOC (through various and unknown transactions) began to “supply” funding out of its synthetic long so as to avoid the worst consequences of the second level’s “short” spiraling out of control. The PBOC more than most operates as a bureaucracy which is often (only) a mismatch to private considerations and conditions. The market wants what it needs, but the central bank often responds with overly pedantic rules of limited operation. In combination then, what appears from the outside to be massive insurance (reserves) against this sort of thing turns out to be wholly inadequate as a matter of both its poor substitution as well as how the scale of reserves indicates the scale of the problem. 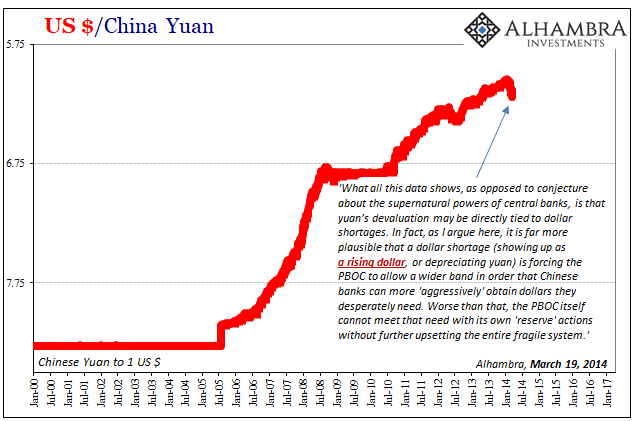 It’s how CNY despite the PBOC holding the biggest “dollar long” ever conceived was completely runover by the eurodollar system anyway. The same risks can be applied to Hong Kong and HKD. The process ends up the same, though in the city’s case the nature of the “short’s” origination isn’t. 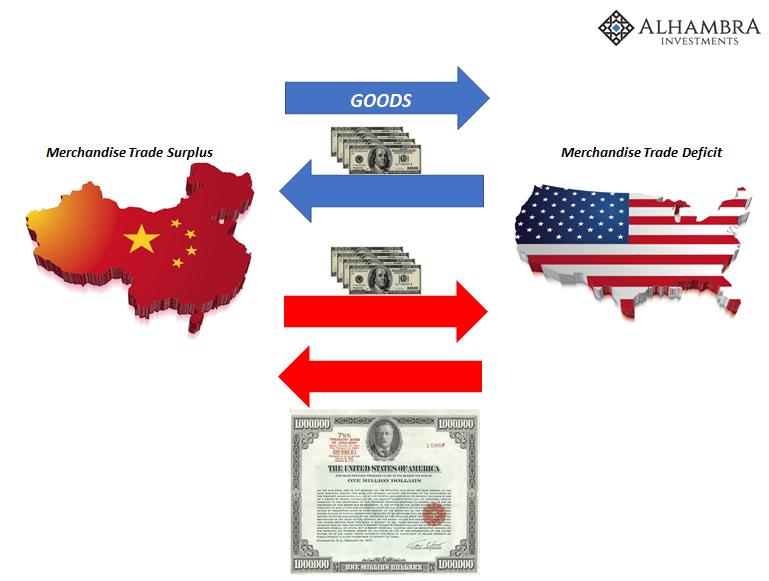 If China’s includes a lot related to global trade, HK’s is more purely financial. Whether that helps or hinders remains to be seen. As a general rule of thumb, financial eurodollar factors tend to be more deliberately problematic.